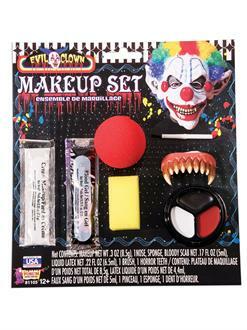 Our Killer Clown Costume Makeup Kit is no joke! It will allow you to have sharp pointed teeth, bloody scabs, a classic red clown nose, and red, black, and white face makeup. It includes 2 colored face makeup, liquid latex, bloody scab, red nose, 1 sponge, 1 Brush, 1 set of teeth.